Hope you’re all having a lovely January! It’s been a heck of a time for us. We had a great Nerd Nite! Thanks to the very kind efforts on the part of the World War 2 Club to stay open for our event in spite of having burst a pipe in the back. Thanks, World War 2 Club! If you went to Nerd Nite: yay! You probably thought Dr. Rebecca Slitt’s presentation about Medieval London eating habits was both informative and fun. You also probably want to make that chickens jousting on pigs dish, because that sounded awesome. To thank Dr. Slitt for her cool presentation, why not buy her excellent Choose Your Path Adventure game, Psy High? It’s a lot of fun, and it’s on a bunch of platforms including iOS and Steam! If you didn’t go to Nerd Nite, why not give it a shot? There are no side effects that anyone can prove. Certainly a statistically insignificant portion of the audience has spontaneously immolated, and less than a percent of attendees are both gifted and cursed with immortality – left to walk the Earth until they can barely remember their loved ones who have long turned to dust. The vast majority of people leave happy to have had a nice night out! We spent a little time this week hanging out at Valley Free Radio recording a radio spot for Nerd Nite, it was a good time! You should listen to Valley Free Radio, they have interesting music and other programming! 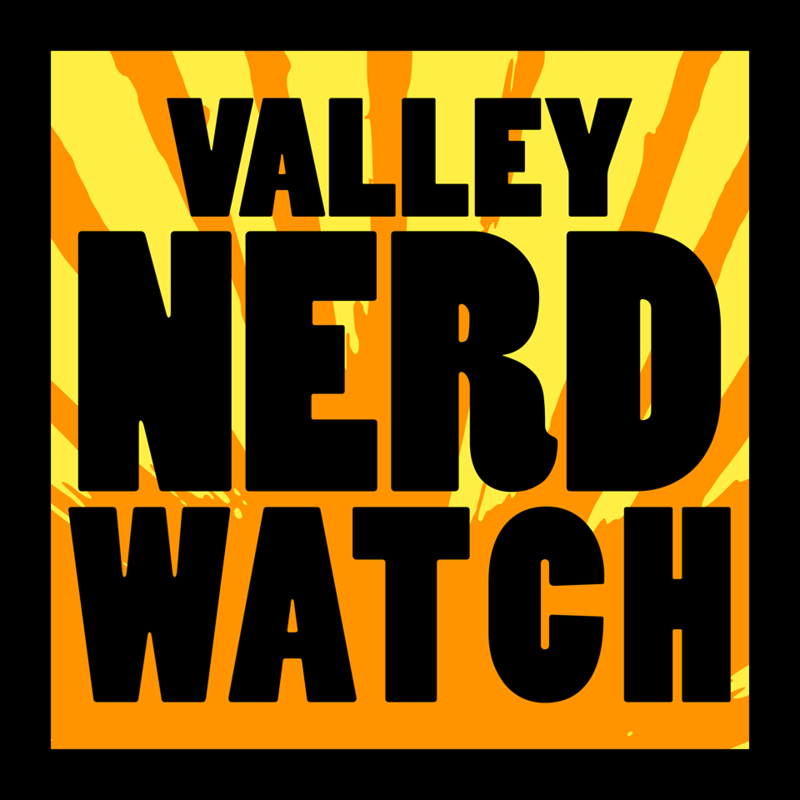 We feel like Nerd Watch Readers would in particular enjoy Evidence Based – a weekly science news program – and Press Start to Continue – a videogame/chiptunes show! It’s next week, but you’ll need a head start if you want to re-read Dune in time to hang out with the folks at the Western Mass Sci-Fi meetup group and talk about Dune at Pizza Paradiso next Thursday! X-Wing is your chance to make like Poe Dameron and compete in a friendly tabletop game where you control a squad of X-Wings represented by cute minatures and fight against an opponent controlling Imperial forces. It seems like a lot of fun! Just be sure to keep it casual. If people in the store see you starting to get real serious, making professional sort of moves? You’d better believe they’ll ask you to take it down a notch. Just be cool. Heroclix this sunday! The perfect opportunity to have all those cool fight scenes you never got in the comics! Batman vs. The Black Panther? Superman vs. Galactus? Galactus vs. the All-State Pie Eating Championships? The possibilites are endless! So long as they involve various miniature super-beings fighting each other! A debut noel set amid the 1999 WTO protests in Seattle! Victor – a scrappy runaway teen – sets out to sell as much pot as possible to a bunch of WTO protestors. With the proceeds, he plans to buy a plane ticket and head out of Seattle forever. But it becomes clear the protest is about to erupt into violence as the police get more and more furstrated! It sounds kind of great, actually. We should read that. Take the Oath! Join the Gatewatch! Sit, watch gates! No, no! Don’t play Magic: the Gathering! You need to watch the gates! If you don’t watch the gates, who knows what might make it through? Please! You must keep your eye on the gates! If they notice you… no… nooooOOOOOooaaaaarrrrrgh! $25 to enter, prizes for winners! Oath of the Gatewatch! Not actually a real oath to defend Earth from the creatures beyond the Veil of the Unseen. Ignore that last missive, it was clearly written by someone without the capability to truly SEE what this world requires. Anyway! Play Magic: the Gathering and try out new cards, win prizes! $25 to enter! Ignore the gates and have fun! This week’s meeting focuses on discussing everyone’s Docker projects and getting help with any questions! No project is too big or small to discuss. If you use Docker, this is the place to get information about how to use it most effectively! Do you use Drupal? Go ahead and talk to other folks who use Drupal! They’ll help you out, you’ll help them out. Everyone wins! The Forbes Film Club will present a free screening of the movie Local Hero. Basically it’s about a man going to Scotland to buy an entire village on behalf of an American oil company, hijinks ensue! Also it’s got the current Doctor Who, Peter Capaldi, in one of his earliest supporting roles, so that’s neat! Aww. Bowie. Well hey why cry when you can see his awesome turn as a weird Goblin King who kidnaps a baby? Lots of babies actually. See beloved musician David Bowie play a child-murdering goblin monster man with fabulous hair! The movie and popcorn are free! You can also meet up with the nice people of the Western Mass Sci-Fi meetup group at this event! Anime? In YOUR library? It’s more likely than you think! What’s that? You thought it was pretty likely, just based off the general demographic that find libraries appealing? Oh. Yeah, okay. It’s not super surprising. Well! Young adults with an interest in anime can hang out at Palmer Library and watch stuff! Forbes! Beautiful Forbes. Fantastic Forbes! What a lovely place to visit. And what’s more, what a lovely place to explore! It’s kind of huge though, and usually you kind of have stuff to do at the library when you visit. So take a few minutes to get a guided tour of the facilities this Saturday, and make use of this friendly local hotspot in a more efficient manner in the future! Registration is required. The LEGO club! Saturdays at the the Children’s Activities room are the right time for LEGO. Themes help kids get cool ideas, and afterward kids can show off their creations in the library! Children may bring LEGOs from home. Mutants & Masterminds would be the perfect place to figure out how your friends might react to finding out you really have superpowers. Just slip subtle hints in there about how “your character” is worried that laser eye-beams will get in the way of friendship with “their friends” and see how players react! Try out an RPG with other folks, and have a nice time! You can adventure as anyone you can imagine! A fighter with a shield and sword? A fighter with a spear? A fighter with a shield and MACE? The possibilities are endless! Modern Myths hosts a long-running Star Wars RPG campaign! We imagine it’s quite far from the description now. We’re going to assume that players eventually settled down and now you mostly roleplay moisture farming and picking up power converters. Join in next session to see if our predictions are correct! New players welcome! Learning and fun at the library! A guest presenter will introduce a science concept with a book and activity to inspire some creativity! This activity is open to all! Learn some science! Read a book! Improve yourself! Build a robot! Improve that robot! Then, make that robot improve itself! Soon, the robot runs things. We could have stopped this, but it’s too late now.